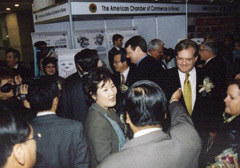 Celebrating the 50th anniversary of The American Chamber of Commerce (AMCHAM) foundation in Korea, Ewha Womans University will host the Second International Business and Cultural Conference (IBCC) on April 9, 2004, at the university's Ewha-Samsung Education & Culture Center. The first conference held on Nov. 14, 2003 focused on Wall Street and Broadway of the Northeast U.S. But in this year's second IBCC event Ewha introduces the west coast of the U.S.A., under the official title "IT Industry of Silicon Valley and the Napa Valley Wine Festival." The event will be sponsored by AMCHAM, Korea International Trade Association (KITA), and Tong Yang Confectionery Corp. Organized by Ewha Convention Management Center, this unique and second of its kind event will be composed of three serial conferences each to be held on different dates between April 9 and May 2004. These conferences will address particularly the business and culture of America as well as the relationship between Korean and America. The three-part event consists of a forum, opening ceremony, and wine festival with special performances. In the first part, U.S. and Korea IT specialists and businessmen will be invited to join in the panel discussion on the current and future trends of the IT industry. Among the forum participants are Mr. Jeffrey Jones, chairman of Partners for the Future Foundation, Dr. Woo Sang-Min, chairman of Association of American State Offices in Korea, and Mr. Cho Sung-Kap, president of the International Cooperation Agency for (Korea) IT. The second part of the event, the opening ceremony comprises a performance and congratulatory addresses by dignitaries including Thomas C. Hubbard, U.S. ambassador to Seoul, Suh Jung-Wook, former science minister. William C. Oberlin, president of AMCHAM will also deliver a congratulatory message. Aside from the ceremony, there will be choir and dance performance by Ehwa Chamber Choir, an amateur but pretty famous choir made up of both under and graduate students of its College of Music. With their first debut album produced last year, the choir was also invited to give a performance at "Jeonju Sori Festival" in August, 2002. The dance club "Action" of Ewha Womans University will stage a dynamic dance performance. Ewha is the world's largest women's university by the number of students. 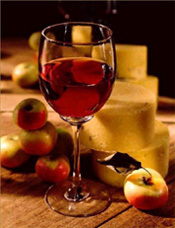 The third and last part of the event will be "Napa Valley Wine Festival of the West Coast." Suh Han-Jeong, the first sommelier in Korea, will lecture on "Basic Knowledge of Wine, Wine Manners and Napa Valley Wine's Features." He became the first Korean to receive "Agriculture Merit Medal" from the French government. He has authored a book "Suh Han-Jeong's Wine Guide." "The conference will highlight the partnership between the U.S. and Korea through the collaboration of business organizations and academia," said Prof. Hwang Hae-Jin, chairperson of the event's organizing committee at Ewha Womans University. "I am confident that the event will offer a valuable opportunity for Korean students to learn about this field and a timely and sound opportunity to strengthen the ties between Korea and the U.S."
For more information, visit the Second International Business and Cultural Conference (IBCC) or call IBCC Secretariat at 02-3277-4050.